Since 1948, Elliott Equipment Company has been building an impeccable reputation that, like our equipment, has stood the test of time. Our continuous pursuit of quality and performance demands our adherence to a specific mission and core set of values. For over 65 years, Elliott Equipment Company has been an innovator in the industry, designing and building unique, multi-functional products, with a team of people who care about you and your needs. Elliott products are built to work and built to last. 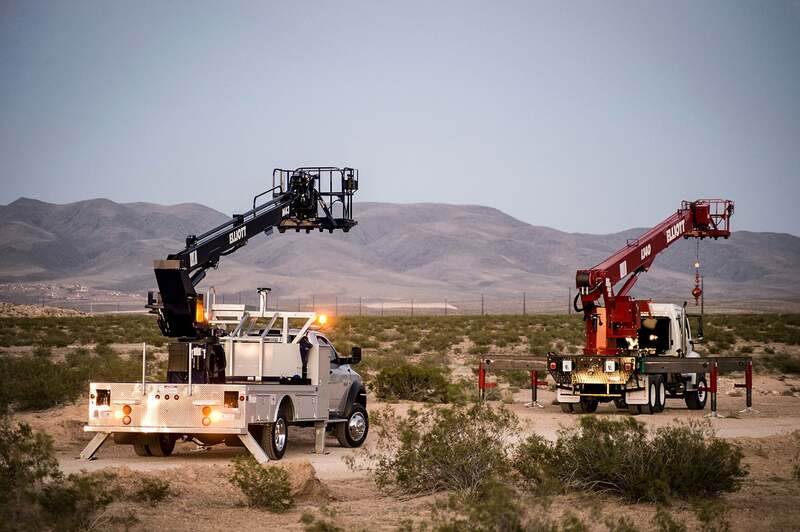 Whether the job involves working deep underground in a mine, performing oilfield support, or installing a transmission line, Elliott aerial work platforms and cranes see action every day in the world’s most demanding environments. Elliott owners enjoy the peace of mind that comes from knowing their investment is backed by the best warranty in the industry. Plus, Elliott’s multi-functionality lets you do more with a single machine. Whether you need to position people, lift loads, work at heights, dig a hole, or any combination, Elliott will work with you to create the best solution for your needs. With Elliott, exceptional products, a strong distributor support network, and the best warranty in the industry are a given. But we know you need more than that. That’s why Elliott offers you the individual attention that you deserve. Whether you need a single machine or an entire fleet, we will listen to your application needs, understand the way you work, and team with you to develop solutions that help reduce costs, increase efficiency, and improve your bottom line. When you buy an Elliott, you can expect to receive the red carpet treatment that you deserve. We Started an Industry and Haven’t Stopped Yet. We started an industry. There’s a lot to be said for being the first. But it’s even better to be the best. That’s what Elliott Equipment Company is all about. Back in 1948, post-war America was on the move. Travelers were taking to the newly created highways in record numbers. 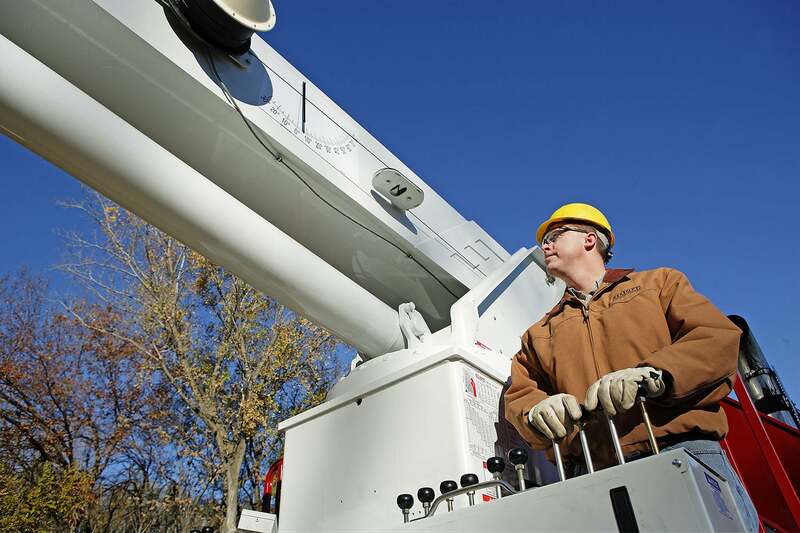 Electrical contractors and utilities were looking for ways to efficiently set poles and string power lines to electrify the country. 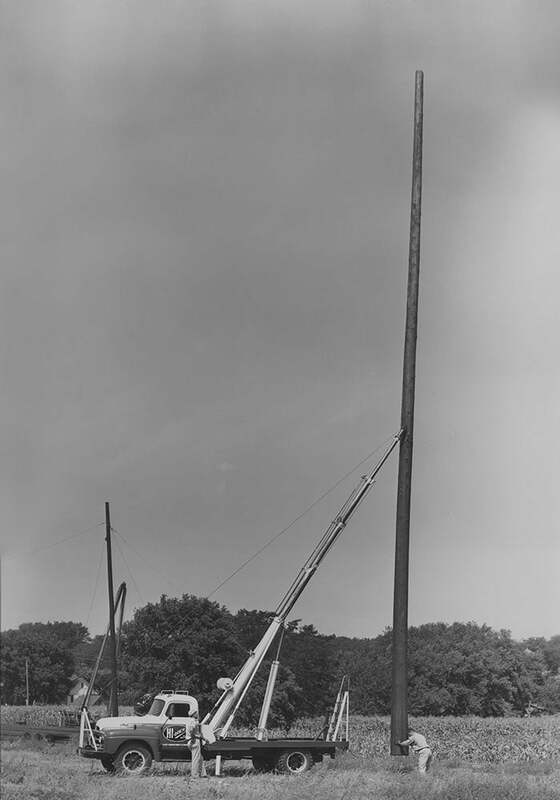 And Richard Elliott, an industry pioneer, developed the first truck-mounted telescoping aerial work platform and crane. And we haven’t stopped yet. 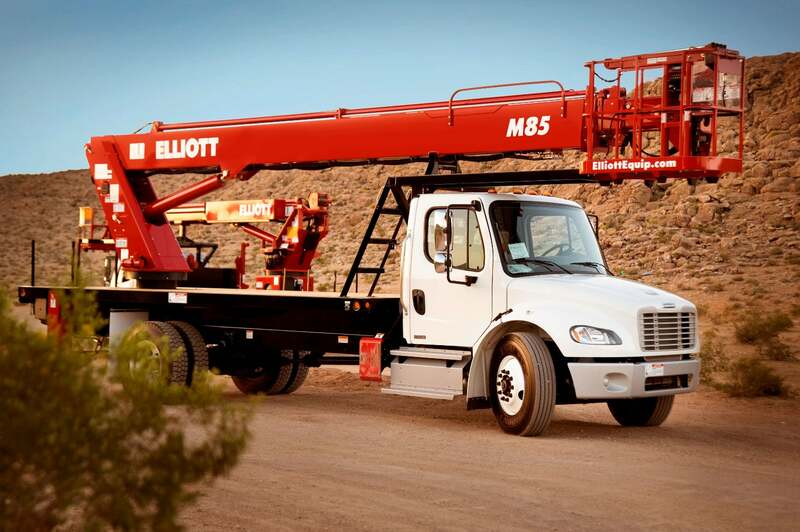 Then, as now, Elliott used only the finest components available to build the first hydraulic, telescoping aerial work platform and crane and mounted on a conventional truck chassis. Building just one machine at a time, he drove each one from city to city – and from coast to coast. It didn’t take long for people to see the value in Elliott’s rugged design and multi-function operation. Elliott’s machines were quickly adopted by utilities, electrical contractors and state highway departments for electrical construction and highway maintenance. Now, Elliott is used in those industries and by new ones including commercial sign installation, mining, and a host of other construction and maintenance applications. Since those humble beginnings, our customer base has grown and so too has our line of telescoping work platforms and cranes -which now numbers more than 40 models, helping workers do an amazing array of jobs. 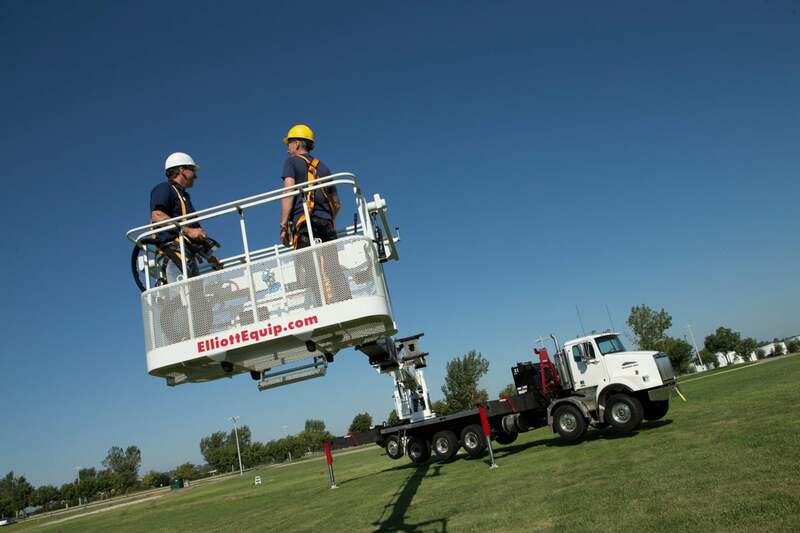 From the original HiReach to the Skywalk, BoomTruck, E-Line, Derrick Digger and Specialty Products, Elliotts are used by leaders in industries such as electrical construction, signs and lighting, oil and gas, construction, railroad and transit, department of transportation, utility, public works, ports and mining. You’ll find Elliott products working hard, every day, around the world. Today, Elliott Equipment Company proudly carries on the tradition that Richard Elliott started more than six decades ago – relying on people who are dedicated to the highest standards for quality, safety and durability, working to design and build the best equipment available; and keeping you working safely and efficiently. What it all boils down to is this – when you see the Elliott logo, you have a piece of equipment that is built using only the highest quality components and backed by the industry’s most comprehensive warranty and a global service network. In other words, you have an investment in equipment that truly stands the test of time. Creating the Best Solutions for Lifting and Positioning People and Materials. This is what we do. Listen to you. Create. Innovate. Build rugged, heavy duty, multi-function machines and back them up so you can do your job safer and more effectively with a single piece of equipment. It is essential in the workplace and the solutions we provide. We are dedicated to exceeding our customer’s expectations. We operate with integrity, in a dynamic environment based on trust, teamwork, mutual respect and fun. We are responsible to our team members, customers and stakeholders to position the business for long-term, profitable growth and financial stability. Find current opportunities at Elliott.